"Jobs to Be Done" is a theory you can use to explain the motivations and desired outcomes behind why people buy. WHAT IS THE "JOBS TO BE DONE" THEORY? The goal of Jobs to Be Done is to understand the outcomes your customers are trying to reach. Think of your customer as though they’re “hiring” your product or service to help them complete a certain type of job. Once hired, your product or service must complete the job which, in turn, achieves a desired outcome and helps the customer make progress in their life. To get a better understanding of this, let’s take a look at a sales concept. Let’s say you’re selling a drill. When someone buys your drill, are they buying the drill? No — they’re coming to you to buy a hole. 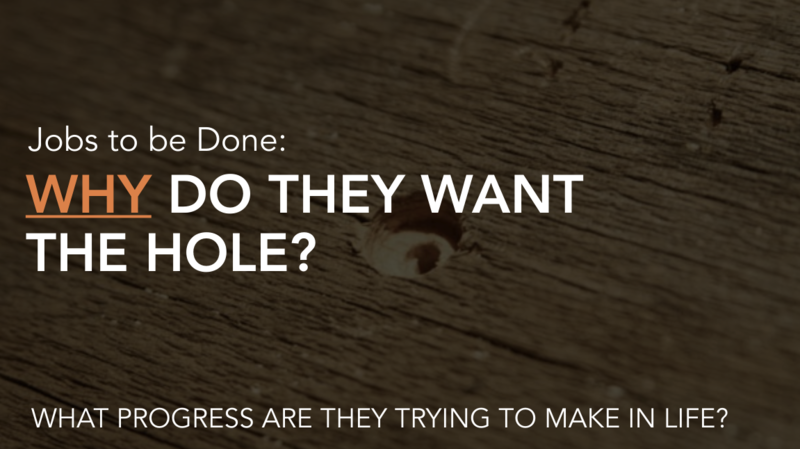 The drill is simply the tool that helps them create that hole. But Jobs to Be Done takes this one step further and asks, “Why do they want the hole in the first place? What’s the desired outcome they’re trying to achieve and is drilling a hole the best way to get to that outcome?” You can see how this is one layer deeper into the underlying motivations of your customers. This was the exact question the company 3M asked themselves, which led to the product design of the hole-free wall hanger: A hanger that achieved the same outcome of hanging items on the wall, but by using a removable sticker, the customer wouldn’t have to drill holes in their walls. Another way to think about it is similar to hiring a person to sit in a role at a company. That company is hiring that person to make progress on a specific goal or metric — there is a desired outcome. Here, people are hiring products or services to sit in a role in their life to make progress on a specific desired outcome. The job and the desired outcome should rarely change, and when they do, it takes years or decades. What will change is what that person is hiring to complete the job. It’s inevitable that as the industry and technology progress, there will be new products or services that come along and are able to do the job better, faster, and cheaper. When the individual understands there’s a better way to complete a job and make faster progress toward an outcome, they’ll “fire” the existing product or service and replace it with the new product. At its essence, this is what we’re trying to accomplish as marketers — to get people to switch to our product or service. This is why the Jobs to Be Done framework is critical in the strategy phase, because it sets the tone of everything else you’ll be doing in the future, from positioning to messaging to website features and so on. Take the (free) Growth-Driven Design certification to learn more about Jobs to Be Done for web design and how it influences other website strategy parts. Want a good Jobs to Be Done book? 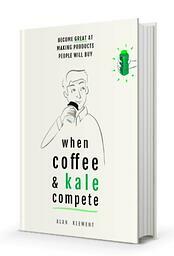 I would highly suggest reading Alan Klement's "When Kale and Coffee Complete." This book gives a great overview on the Jobs to Be Done theory and how to apply it to products (or web design). Here's a great talk by Sian Townshed of Intercom on how they went through the Jobs to be Done process and the ripple effect it had across the organization. Need a Full Website Strategy Blueprint? Looking for training, templates, and tools to help you build a rock solid website strategy? Complete the (free) Growth-Driven Design Certification and learn the complete playbook for building and optimizing a peak-performing website. In order to start understanding the journey your users go through and their underlying job to be done, you must conduct user interviews. The job to be done discovery interview takes a very specific format. To help, here is a video role-play by Kevin Kupillas. Here's another example from our friends at JobsToBeDone.org. You can use this free Jobs to Be Done discovery interview template to help (huge hat tip to Kevin Kupillas for contributing this template). Lastly, if you have never conducted user interviews before, you can get the deep-dive on the overall interview process on our "UX Research: Conducting User Interviews" page. — it helps us understand user motivations and desired outcomes. Start the (free) Growth-Driven Design certification to get the deep dive training, templates, and help you need to build a peak-performing website using agile. Interested in the theory behind Jobs to Be Done? Are you interested in learning more about the underlying concepts that create the "Jobs to Be Done" theory? Here's a 2017 presentation by Alan Kelement, a thought leader in the theory. Enjoy these hand-selected additional resources about the Jobs to Be Done theory. Want to learn the new playbook for building and optimizing a website that incorporates many concepts, including the agile process? 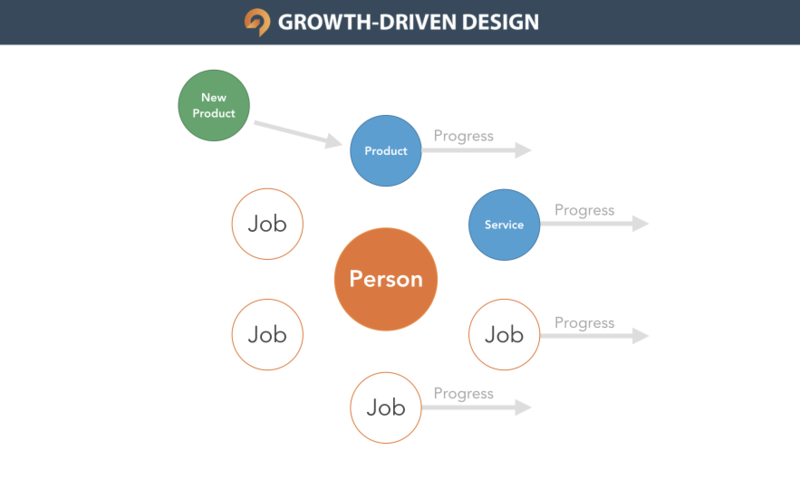 Take the (free) Growth-Driven Design Certification - Learn More. Interested in reading up on both agile and other modern product / website design processes? Check out this currated list of books to read.